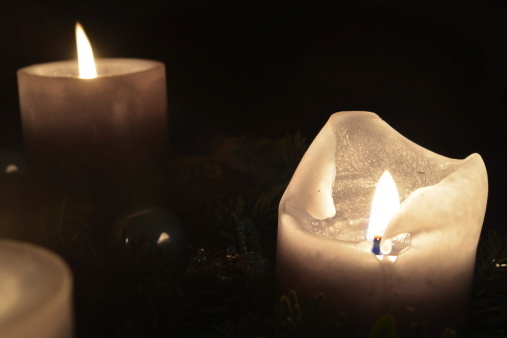 Candles have been around for thousands of years. Until electricity, they were merely a source of light. Today, they are more used as a decorative accent. True, they do add a soft glow and wonderful light to your home. Scented candles go one step further and add practically any smell under the sun. If you burn candles in your home with any regularity, chances are that you’ve spilled melted wax on the carpet more than once. Thankfully, you can remove melted wax from carpet in just a matter of minutes. The good news is that you can attack the stain immediately and remove the wax from the carpet. The better news is that if one of your party guests neglected to tell you about the spilled wax, you can still remove it all and leave no trace. One warning: If you’ve spilled wax onto an Oriental rug that is an antique, silk, or part silk, contact a professional to remove the stain. They are more delicate and generally more expensive. If wax is still soft, put some ice in a plastic bag and place over the spot to harden the wax. If it’s set, gently scrape the hardened wax with a butter knife to remove as much as you can. Use a vacuum to remove the small pieces of wax that you have scraped off. Preheat iron to lowest setting. You can use a white kitchen towel or brown paper bag as a blotter to absorb the wax. WARNING: Be sure there is no printing on the paper bag. When heated, the ink will be transferred to your carpet, which is much more difficult to remove. Gently press the warm iron over the waxy area until it melts and adheres to the blotter. You should keep the iron moving in a circular motion to prevent it from scorching the carpet fibers. When the wax has been absorbed, lift the blotter from the carpet. Repeat as necessary, with a new blotter each time. If not, you’ll simply put the wax you’ve removed back onto the carpet. Use a small amount of rubbing alcohol or carpet cleaner on the spot to remove any dye. Be careful not to allow the alcohol to absorb deeply into the carpet as it can loosen the glue that holds the fibers in place. Blot with a clean white cloth to remove the alcohol or carpet cleaner. Repeat until the dye no longer appears on your carpet. Sponge the area with water to rinse and blot again until the area is dry to the touch. Cover area with clean kitchen towel or stack of paper towels and some weight on top. You can use a few heavy books for this. Leave for several hours to absorb any remaining liquid. When it’s completely dry, vacuum to return fibers to normal texture. Whether you want to put in a flower garden or plant some vegetables, if you have poor soil quality or live in an arid climate, building a raised garden may be your only viable option. Even if you live in a perfect climate and have always had a garden, constructing a raised garden affords you some advantages over a standard on-the-ground garden. The only requirements are that you want to make sure that it’s level, that you have a place with plenty of sunshine, and that you’re able to give the plant’s roots enough room to grow, which is generally about six inches. If you want to grow vegetables and you’re using lumber, make sure that it’s not treated wood. Since it’s higher, there’s less wear and tear on your knees and back. Gives you more control and more plant productivity per square foot. Not necessarily insects, but a raised garden eliminates damage caused by rabbits, moles and gophers. You’ll use less water and less pesticides because your growing area is concentrated. Since it’s elevated, you’re less likely to see weeds, especially if you put down a weed barrier. In areas that have sandy soil, it’s difficult to ensure that your plants are getting enough water. In areas with clay soils, water doesn’t drain, which can damage the roots. Since you’re not walking through the garden while working, the soil stays nice and loose. This is essential for helping roots establish earlier in the season and makes it possible to extend your growing season. The frame provides a barrier to erosion. You can put a raised garden anywhere and make it any shape. You can even put one on your deck. Build your new plot out of reclaimed materials, including cinder blocks, wood or stone for the walls. Interested in building a raised bed for flowers or vegetables? Painting a room is perhaps the easiest and least expensive do-it-yourself project that can have a BIG impact on your home. However, many homeowners find painting the ceiling somewhat intimidating. In order to complete a room, painting the ceiling is part of the project. Yes, compared to the walls, painting a ceiling does require some special equipment – a stepladder and an extension pole. It is somewhat more physically demanding than painting the wall. However, just like painting the walls, putting a little extra time and effort into prep time pays big dividends in overall time, effort, cleanup and the end result. Here are some tips to help you finish the job just like the pros. Remove as much of the furniture as you can. Not only does it make moving in the space easier, it limits damage that can be caused to furniture. Make sure to cover the furniture you don’t remove with drop cloths. If you are painting the entire room, the ceiling is where you should start. And you may avoid taping. If you are painting the ceiling only, use painter’s tape where the walls meet the ceiling and around any molding on the ceiling’s edges. It may seem like an added step, but adding a coat of primer provides a stain barrier and can make it possible to finish the ceiling with only one coat of paint. Starting in one corner, with a 2″ trim brush, paint a three foot cut-line along one wall, then the adjoining wall. 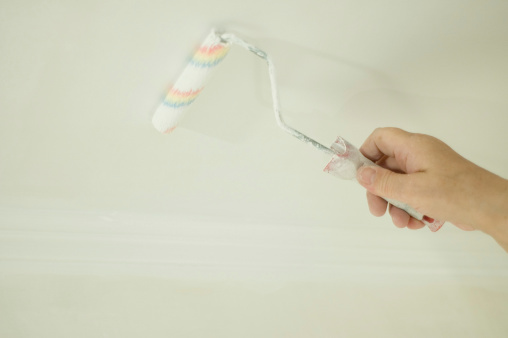 While the cut-line is still wet, start painting the ceiling with the roller. Just like painting a wall, painting while the cut-line is still wet will help reduce visible lines. Fill the well of the roller tray with paint and move the roller over the paint until the nap is covered. Don’t submerge the roller; just glide it over the paint in the shallow part of the tray until the nap is completely covered and paint drips are minimal. Unless you’re 6’6” and working on 8’ ceilings, you’ll need to attach the extension pole to the roller. Use the paint-filled roller to create a zigzag pattern measuring 3-4 feet square. Then go over the same area using straight strokes to even out the paint. Remember to work while the paint is still wet to avoid leaving paint lines. Paint smaller sections and be sure to feather the edges to reduce visible lines between sections. The secret is to work quickly and efficiently. Prep work cuts painting time, which means you’ll be working with wet paint and less likely to leave visible lines. Like any painting project, you may need to repeat the process. Be sure to clean any splatters and drips immediately, and to clean paintbrushes, roller and tray with warm soap and water when you’re finished. Brightening your home can be accomplished quickly, easily and cheaply. There’s no need, however, to limit yourself to using color only on walls when there are so many other opportunities in your home to use an accent color. If you’re looking around and see a neutral-hued home, try adding color in these unique places. Whether you have built-in or freestanding bookcases, painting the inside of it adds color to a room in an unexpected way while becoming an attractive backdrop for whatever you put on the shelves. Just because your storage cabinets are practical doesn’t mean they have to get lost in the background. Choose a bright, bold color to truly make a statement. Try placing several small pieces of pottery together to add color to any neutral-colored room. Grouping pieces is both art and science. Too much looks like clutter; too few and it looks like an accident. From bright to subdued, solid or patterned, and finishes ranging from antique to distressed, painting wooden furniture can give an old piece new life while adding color to any room. You’re really only limited to your imagination. You may give a lot of consideration to the color of your exterior doors, but not give your interior doors much of a thought at all. Painting an interior door with a bold color packs a punch, especially for a hallway or rooms bathed in neutral tones. You may choose to paint the woodwork around windows and along floorboards to match the door or keep them white, which allows the door to do all the talking. If your dining room is filled with neutral tones, adding brightly colored chairs is a great way to add color. Mismatched chairs painted the same color with coordinating cushions is a great way to add color, unique pieces, and whimsy to your dining room. Often considered taboo, painting a floor has been a no-no, but it really depends on how the room is used. You may choose to paint the floor of a child’s room, craft room or game room, just to name a few. One of the coolest places to use an accent color is in a window seat alcove. You may choose to enhance the view outside or paint it in a warm inviting color to create a bright, cheerful space for a reading nook. For the most part, ceilings don’t vary much when it comes to color. That being said, a bold color on the ceiling is a bold choice and can add character to any room. Perhaps more surprising than adding color to a ceiling or painting the floor, painting the stairs has been a decorating trend for a couple of years. You may choose colors to coordinate with those in other areas of your home, or do something odd or whimsical or daring.